When you add new profiles to Lamplight a duplicate check is carried out to make sure you’re not trying to create a profile that already exists. This is done by Lamplight checking either that the name sounds similar (so the spelling might be different) or name matches. If you’ve imported data from a spreadsheet or another system then the possibility of bringing duplicate profiles into Lamplight can increase. To make sure you’re using Lamplight as effectively as possible you should de-duplicate your profiles as soon as possible. 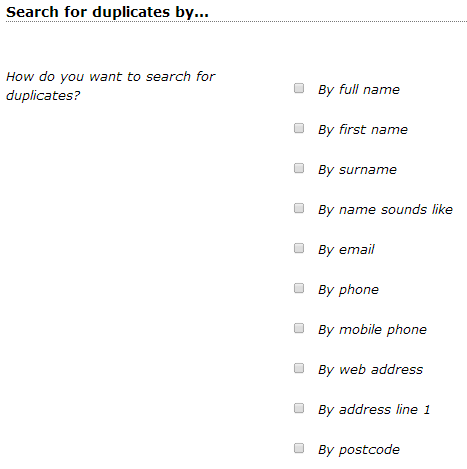 Within the system administration section there is now a link that allows your admin to de-duplicate records. Once you’ve selected a profile from the drop down list, the possible matches will appear in the list on the right. You will see the profiles side by side and you will have the option of merging or overwriting each section, as per the instructions below. Once you’ve finished you can delete the source profile.